You are cordially invited to attend the CSZ Seniors annual Chanukah Luncheon on Wednesday, December 5, 2018 at 12:15 p.m. at Congregation Shaarey Zedek. We will serve a hot catered meal and everyone will receive a special Chanukah treat to take home. The cost of the lunch is $10 per person, and reservations are needed no later than Thursday, November 29, 2018. To reserve your place, contact Janet Pont at 248.357.5544 ext. 33. Payment must accompany your reservation. 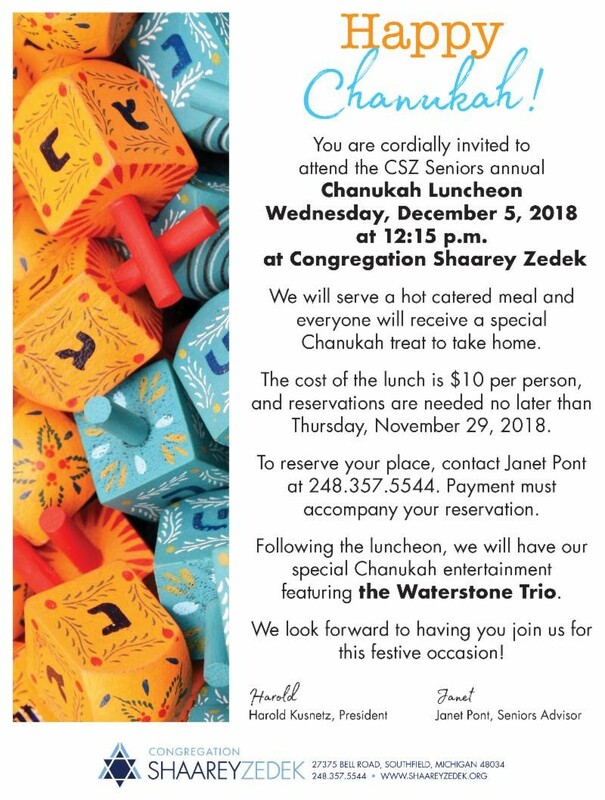 following the luncheon, we will have our special Chanukah entertainment featuring the Waterstone Trio. We look forward to having you join us for this festive occasion! Register with Janet Pont at jpont@shaareyzedek.org or call 248.357.5544 ext. 33.